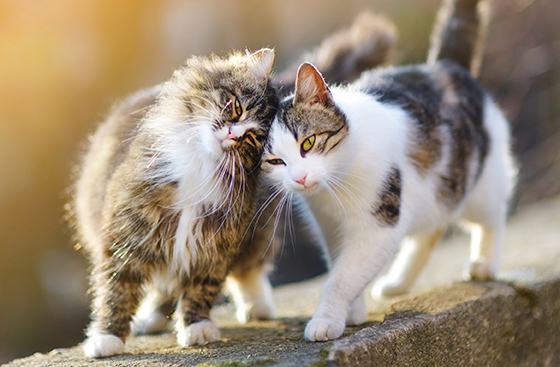 Cats can be quite territorial – especially if they’re used to being the only cat – but they can and will form close friendships with other cats. Be patient and give the process time; some cats require up to a year to decide if they like someone or not. When you bring a new cat home it’s a good idea to separate it from any other pets. Give it a room of its own and some time to settle in. Some cats will take to each other at once, and others need some time. Human impatience is often the biggest problem when introducing pets. It’s ideal to have the new cat in a separate bedroom with the door closed. Give the cats a chance to smell and hear each other through the door, without being able to see or touch each other. Give the kitties food and any special treats close to the separating door. This can help them feel that being close to the other is a positive thing. Switch the cats after a few days, so they can explore the smells on the other side of the door. Rub your new cat with a towel to get their scent on it. Let the other cat sniff, and rub them as well. Repeat. Play with both cats close to the door, so they get used to hearing each other. With a cat and a person on each side of the screen, let the cats see each other. Redirect their attention by saying their name and throwing a treat or toy behind them. Give this stage time, offer meals and treats, and play close to the screen. Once the cats do well with this stage, it’s time to meet. Bring the cats together when they’re calm and keep a squirt bottle with water handy, just in case. Sometimes one of the cats hides from the other or bullies the other. Go back to separating them and introduce at a slower rate.